Loomed by women in India, this refreshing scarf is inspired by warm days spent in cool swimming pools. Go ahead, dip your toe into a new look. 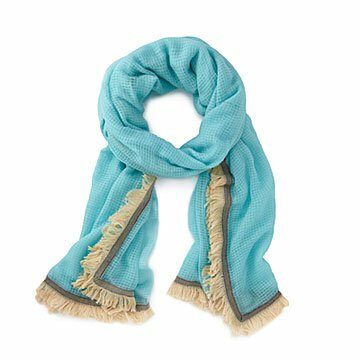 Hand-loomed by women in India, this refreshing scarf is inspired by warm days spent in cool swimming pools. Vibrant aqua is trimmed with soft gray fringe—every pool needs a patio, right?—making it just the right choice for sipping umbrella-topped cocktails or a garden party with friends. It'll add a pop of color to your classic white tee, or wear it as a sarong for some sweet lounging. Made from silk and cotton in India.